Birth as a Healing Experience: The Emotional Journey of Pregnancy through Postpartum emphasizes and examines the emotional aspects of pregnancy and postpartum, presenting these periods as important opportunities for a woman's growth and healing from previous traumatic births or pregnancy losses. Midwives, childbirth educators, pregnant and postpartum women, women of childbearing age, and men will find that this book is unlike most others on pregnancy because it focuses on the healing potential in pregnancy, childbirth, and postpartum rather than on the medical aspects. Women's stories illustrate how individuals deal with past experiences of grief and loss during pregnancy in a therapeutic setting. "This book creates a tender network of words for today's vulnerable new mother. Each woman reading it will surely feel kinship with those whose stories are told and be quite aware of the deep compassion resonating from every page." "This wonderful book treats birth as a profound opportunity for emotional healing within a compassionate circle of women. It contains a wealth of information and stories of pregnant women and their helpers or for anyone interested in a wise woman's perspective on birth as a sacred event." "Birth is not an isolated event that is forgotten the moment the labor ends. When women emerge from their birth experiences bruised and battered, there is a ripple effect that affects society at large. When women are healed of their birth-related injuries, we all benefit. Thanks to Lois for her thoughtful and gentle work. Her dedication and expertise are genuine; this is a most valuable work." “Lois Freedman's book talks about a subject that is often missing from the masses of books on pregnancy out there: the emotional aspects of this most important time in a woman's life. For so many woman, being pregnant brings up fear and pain and yet this is never fully discussed with her health care providers or even her closest friends. For me, the section on mother-loss was especially important because I had lost my mother in my teens. I found the time of pregnancy and new mothering difficult even though I had great support from my husband, relatives and friends. Lois' book truly helped me to understand what I was going through and gave me suggestions for coping with my feelings and improving my experience. 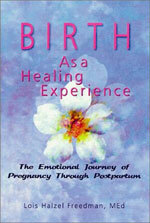 To order a copy of Birth as a Healing Experience,, go to Amazon.com.